Just finished up my Zenith C845 last night, and I'll have to say, it sounds fantastic. I've heard a lot of folks on ARF say just how good of a set they are and now I have first hand knowledge and totally agree. Deep, rich sound not to mention the cabinet is in great shape. Just need to find some new knobs as the tuning dial is yellowed and the chrome is worn off of the volume/on-off knob. Otherwise, I think I found my new daily driver. I have a similar radio, one of my favorites! How about some pictures of your radio? First one is of it on the bench doing some burn in testing. Note the electrolytic replacement, as you can tell I wasn't necessarily going for originality In the second photo, I could use a replacement knob or two, but no big deal for now. I picked one of these up recently for $5. The look of the radio got my attention and for the price I couldn't turn it down. I do have a question though, Is there a special way or tool required to get these knobs off? I tried to pull them but they won't budge. I quit because I was afraid of breaking them. My knobs were on there pretty snug, however, a firm tug was all it took to get them off of there. One note though, the tuning and selector knobs are two separate pieces...take the selector knob (inside) off first, then the outer, tuning knob. By the way, $5 was a GREAT deal! I will have another go at it. Your radio is BEAUTIFUL! I own the C845, the H845, and the X338, all of which are pretty much the same radio, and they're all terrific. Only one of the three is recapped, but they all sound great. Tons of volume, and great tone. 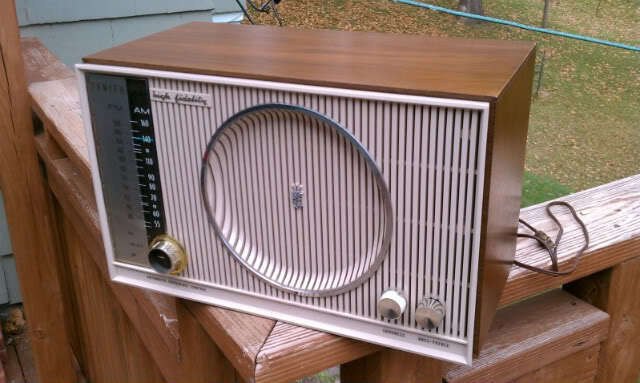 To me, it's one of the best table radios ever made! I've been trying to get the last in this series, the X337. But they tend to be hard to find. In fact, although there's a couple of them for sale on eBay now, you rarely find them there. I wouldn't worry too much about those knobs. 99% of the ones I've seen (and all the ones I own) have that problem to one degree or another. That's the one thing that Zenith really skimped on, because it sure wasn't the electronics! Oh, here's a restoration tip. I do this on all of these radios. Take off the front faceplate and wash it in the sink with warm, soapy water. You'd be surprised how much dust and junk has found its way in between the faceplate and the wooden case. Plus, there's always some dirt in those slats. You don't need to take the speakers out or anything. Once you clean it up, it looks really nice. Yours doesn't look that dirty, but you'd be surprised how much it improves the look of the set. I had the same problem with the first one I bought. Except some knucklehead replaced the dial cord with fishing line! Needless to say, it slipped like hell. I've got the Sams Photofact for the H845, I think. The stringing diagram should be the same. I'll send it to you. Also, make sure you lubricate the bearings in the tuning capacitor. I use WD-40 and it works great. It'll loosen up almost anything. David, I recently purchased the H845 model from that auction site. As received it was not working. Found filament open in one tube. The radio played fine with a replacement tube and all the original caps. I was impressed by the crisp fidelity on the AM stations. FM worked fine but the sensitivity and selectivity was a little poor compared to other Zenith models that I've tried. The radio was very dirty and the plastic front had some bad stains that wouldn't clean up. So I primed and painted the plastic front and now it looks very good. I like the lighted dial on this model. Well the radio played daily for several weeks and then the volume started to drop and it began to sound somewhat distorted. So the radio is sitting out of use in my workshop waiting for new caps etc. By the way, I like your chassis jig as shown in your photo. 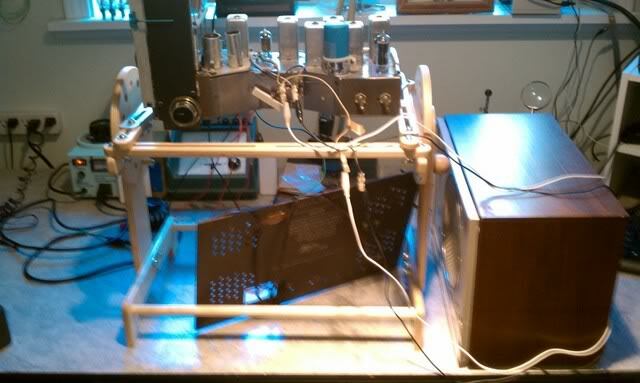 I use a homemade jig but it was difficult to hold the odd shaped chassis of the H845. Have two of these on the storage shelf--both terribly afflicted with the Dreaded SILVER MICA DISEASE. Way too many IF cans to go through. Some day when I have a month and absolutely nothing else to do. These were wonderful radios--except for their tendency to come down with the SMD. Received the schematics. Thanks guys!! If you got the schematic/Photofact for the X338 or C845 (or both) can you please e-mail them to me? Thanks! ...By the way, I like your chassis jig as shown in your photo. I use a homemade jig but it was difficult to hold the odd shaped chassis of the H845. He has the small size, which is what you see in the photos, and a larger size for console chassis, etc. When the old forums come back on line, if you search for his name, I believe you'll find some photos of both of them. I too picked up a C845 at the Lansing meet in July, Club Auction for $3. Blond cabinet with little finish loss on top. Even though I'm into more pre-war woodies, thought I'd get this to flip on the "bay" After a thorough cleaning, plugged her in & she played just fine. Thoughts of the "bay" SOON diminished. Took a black Sharpie & went over the lettering on the front. A dab of "Nano polish" (from auto parts store) on the chrome ring, to ease the very slight pitting & a coat of paste wax for protection, the entire front looks like new. Tried in the "classifieds" to get 2 original feet for it, but no one showed up. Can't imagine how 2 of them can be perfect & the other 2 disintegrated almost down to the screws!! Haven't played it much, been messing with some Blonder-Tongue FMers. The style & design didn't strike me at first (an acquired taste for me) IMHO but what the heck, for $3 She's a Keeper. BTW, an easy trick for removing "stuck" knobs, place a loop of wire behind them & pull. If all else fails, then check for a set screw!! Awaiting for the DREADED SMD now!! Ooohhh Noooo, What’s the Matter NOW?? It WAS Working GREAT before I “FIXED IT”!! I too picked up a C845 at the Lansing meet in July, Club Auction for $3. Blond cabinet with little finish loss on top. That's the deal of the century! Lloyd, The H845 I purchased was also missing one of the feet. The other 3 were good. This was my solution for that problem. Recently our bread machine gave up the ghost. I stripped all the usable parts and hardware from it before throwing in the garbage. I saved 4 rubber feet. I used one of them on the radio. A little filing on the foot and the radio sets evenly now!